I think the last time I painted my nails was for New Year’s Eve 2012. And I’m pretty sure I had all of the polish picked off by noon the next day. Nail polish and I just don’t get along. It nicks and chips and then I obsess over it and peel it all off. 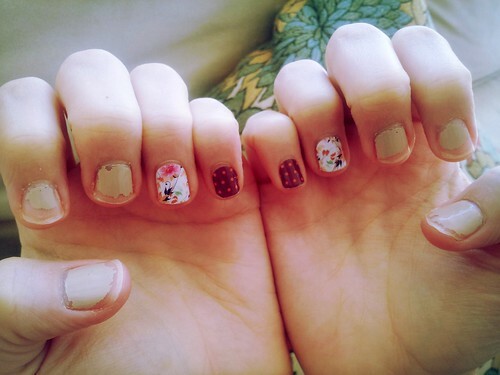 And so, I usually have bare nails. Jamberry nail wraps are little adhesive wraps that super ultra stick to your clean, unpolished nails when heated and are the answer to my I-want-cute-nails-but-hate-chipped-polish prayers. Once they cool, they stay perfectly in place for up to two weeks on fingernails and up to six weeks on toenails. Jamberry nail wraps are sold in $15US/$17CDN sheets of various sizes that are enough for two sets of hands and two sets of toes. You apply them yourself with a few basic tools and they last for weeks, so the price is really quite reasonable compared to the price of a salon mani/pedi. Jamberry wraps are made out of a material called Acrylates Copolymer which is a non-toxic, vegan, gluten-free, latex-free material deemed completely safe for cosmetic use on adults and kids. I checked the Environmental Working Group page and even they had nothing bad to say about this material. When the temporary adhesive on the backside of these polymer wraps is warmed, it creates a solid, waterproof bond with the nails that makes them incredibly durable. I received a sample of the Jamberry nail wraps from a Jamberry consultant to review last month. As an experiment, I applied the Jamberry wraps to my pinky and ring fingernails and painted the rest with a neutral polish with the goal to keep them all on for a full week to see how the wraps compare to polish. I noticed right away that I could feel the Jamberry wraps on my fingernails. The wraps don’t really weigh anything, but I could sense they were hugging my nails. But after a few hours, that sensation left and I couldn’t feel a difference between the wrapped nails and the polished ones. As you can see, the polish is a wreck. But the wraps look slightly grown out, but otherwise great. When I was ready to remove the wraps, I warmed them with my hair dryer for a few seconds and slowly peeled them off. The removal didn’t hurt and my nails looked and felt perfectly healthy under there – no damage, residue or discoloration. 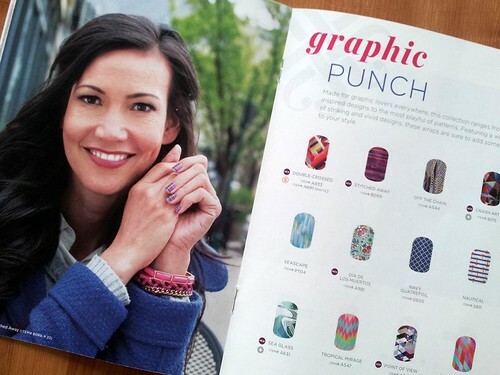 Visit the Jamberry website or get a copy of their catalog to see the hundreds of fun designs available. The wraps are organized by design, color and finish. There are seasonal designs like pumpkins and turkeys. There are Jamberry Junior wraps sized and patterned for children’s nails. There are Mommy & Me matching sets for moms and daughters to share. And there is even a way to design your own wraps by uploading images to the Nail Art Studio. The options are overwhelming and I can see how easy it is to get excited about the company and its products. Jamberry Nails is a direct sales company. If you have the time and charisma for selling, this is the hot new company to get involved with. 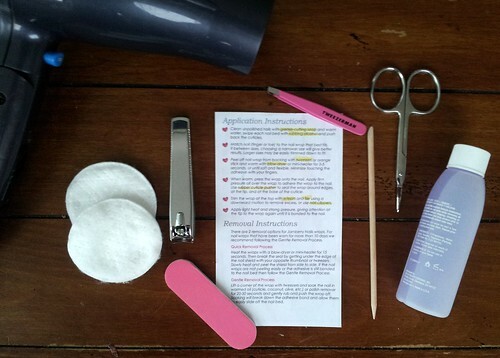 You can choose to be a hobbyist or pro consultant to sell nail wraps and recruit others to sell under you. Pros commit to a greater volume of sales and chip in $10 a month to maintain a personalized website through which customers can place orders for their wraps. You can, of course, shop directly through the Jamberry Nails website, but if you have a friend who is a Jamberry consultant, do her a solid and order the wraps through her. It doesn’t cost you anything extra, but does give her some business. BUY THEM: You can purchase Jamberry nail wraps and take advantage of the Buy 3 Get 1 FREE promotions going on right now HERE. Or request a sample HERE. WIN IT: One lucky US/CAN reader will win three Jamberry Nail wraps sheets of their choice ($50 value!). Enter to WIN via Rafflecopter below. Also, stay tuned as two of our other contributors had a chance to try Jamberry Nails and they will be posting a review/giveaway as well! The Icy Taupe Polka looks fun! I want some of those cute Halloween wraps! i would absolutely love to try FRIGHT NIGHT (MATTE)!!! So many cute ones…love the jacks and corns for Halloween! I would love to try Let it Snow, Lady Lace and Puppy Love! I would love to try so many – Iced, Midnight Celebration, Winter’s Edge. Army Camo, Chalkboard Hearts, Tight Knit, Sheet Music and so many more! I would like to try Let It Snow, Chi O Owl, and Carnival. I love ‘Let it Snow’. ‘End Zone’ would be a lot of fun for game days as well! I like the kiss me ombre. My daughter would love to try the WEBS & MONSTERS. I like the Let it Snow! I like the Let it Snow design. I like the Brown Giraffe! I would like to try the turple ombre. I’d love the Let It Snow and Midnight Celebration! Very pretty! I love the Icy Pink Polka! i would love to the sister style! I would love to try mint green chevron, feeling festive and metallic berry. I want to try LET IT SNOW! I love the Let it Snow! I like the Kiss Me Ombre! Shake Your Tail Feather and Diamond Dust Sparkle! I like the Let It Snow, the Snow and Ice and the Fright Night! Its so hard to choose! The halloween themed ones are so cute. So are the winter snow ones. But I really like the Birds of a Feather too. I would like to try iced, shake your tail feather, and santa’s suit. Jamberrys are awesome! Icy Boysenberry Polka, Black Bats, Tight Knit and Dia De Los Muertos. I have never tried Jamberry’s and would love to! There are so many that I like but my favorites are Adam’s Favorite, Gymnastics and University of Virginia. in honor of frozen I want to try let it snow. I would like the let it snow, the navy stripe and the casual friday. Diamond Dust Sparkle is so pretty! Iced, Carnival and Let It Snow are my current favs! I’d like to try Icy Boysenberry Polka and Monster Mash! I’d like to try Luna, chantilly and white chevron. It was tough to pick my favourites! I like Silver Floral on Magenta, Everything Nice and Kiss Me Ombre. Love the santa suits and the confetti cake wraps. I’d like to try the Silver Floral on Magenta wraps. I loved the Diamond Dust Sparkle. I love anything that sparkles so this is the one for me. Lots of pretty designs though. Metallic chrome silver looks fun to wear! I love Let it Snow and Icy Bosenberry Polka Dot. I would love to try Pumpkin Spice – I see posts about it on Facebook and it looks so adorable! Perfect color combo for Fall. I love On The Fringe! I would love to try Reindeer Games, Midnight Celebration and Seascape. There are so many great designs! I like ABC 123 for my daughter and Mint Green & Gold Horizontal Pinstripe for me. any of the florals – there are too many cute ones to pick?! Kiss Me Ombre, Birds of a Feather and China Rose, to name a few. The Let It Snow is so pretty! I would choose LET IT SNOW, FIREWORKS and CHEETAH ILLUSIONS. I really like let it snow and black floral and many others. I’d like to try Midnight Celebration and Rose Gold. these look awesome my daughter and I cannot wait to try these. Would love to try the fall/Halloween themed jamberry or the one named “everything nice”… Thanks!! I love let it snow! The Kiss me Ombre for sure ! I would love to try Winter’s Edge. Thanks for the chance to win! I’d love to try Sugar and Spice and Rose Gold Sparkle. I like the Rose Gold Sparkle and Silver Floral. I like the Rose Gold sparkle and the candy cane. I’d love to try the Let It Snow, Sugar and Spice and the Iced wraps. Let it Snow! So pretty! I like let it snow the most. I’ve had my eyes on the Seaglass set, but Winter’s Edge is perfect for the holidays! I would like to try the Let It Snow and Winters Edge wraps. I love the Let it Snow and the Candy Cane. Shake yo tail feather girl! I really like the Eclipse and Diamond Dust Sparkle. I’d like to try Gobble Me Up for Thanksgiving. Sweet Whimsy and White Romance would be so pretty! Sheet Music…for my daughter n law. I would love to try carnival. I would like to try their Icy Boysenberry Polka Dot, Rose Gold Sparkle and Let It Snow! My daughter and granddaughter (she was 5 at the time) both loved the Jamberry wraps that I gave to them.